Right, it’ll be your turn in a minute. Focus on a smooth swing. You don’t want to duff the very first shot in front of your new friends. What a course this is though! Surely one of the most spectacular in the world. Eighteen holes in a volcanic crater. Those high slopes of red-brown rock over there didn’t even exist until an eruption in 1973. So, on this island at least, you’re literally as old as the hills. The lava covered hundreds of houses – the Pompeii of the North – but amazingly everyone survived. Oh, you’re up. What have we got? A 367-yard par 4. Not exactly easing you in gently. Take the 5 wood. Here goes. OK, that went 200 yards, kind of straight. You’ll take that. Didn’t get all of it, but your playing partners think you deliberately hit it low to stay out of the swirling wind. Ha! Let the illusion of competence last a little while longer. They’ll find out soon enough. A bit sooner than you’d hoped, in fact. Four putts and a seven on the card. That’s a bit embarrassing. Maybe you shouldn’t be taking so many photos? It’s all just so stunning. But if you don’t pay attention, this could get humiliating. Here’s your chance. Second tee. Concentrate. 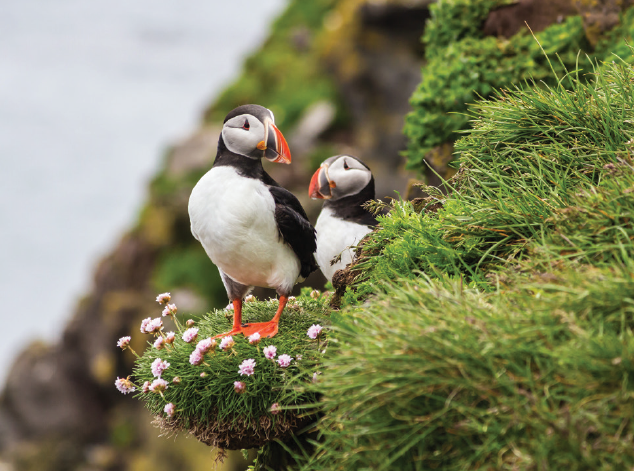 Concentr… Ooh, look at the pretty puffins! 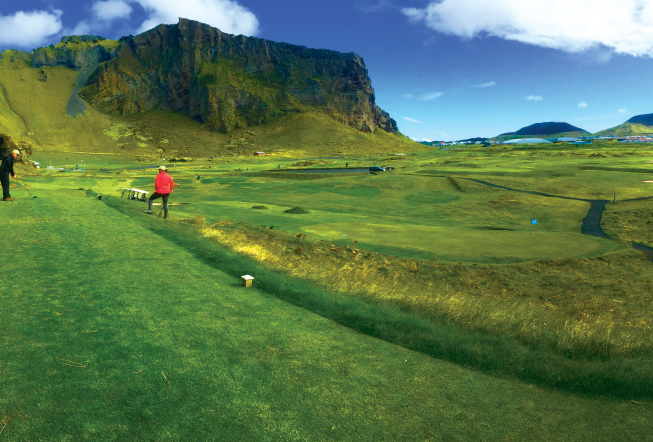 Few places inspire a rambling inner monologue quite like the Vestmannaeyjar Golf Club on Heimaey, the largest of Iceland’s Westman Islands. Occupying a long- extinct caldera between lava cliffs ancient and modern, the fishing town and an azure sea, this extraordinary course presents both a stern test of your technique and the yet greater challenge of keeping your mind on the game when every hole offers a different but staggeringly beautiful view. The Westman Islands were the fitting climax to our Icelandic circumnavigation aboard MS Ocean Diamond, operated by Iceland Pro Cruises. This expedition-style vessel plies the icy waters of Antarctica during the winter and the captivating fjord-indented coastlines of Iceland and Greenland in spring and summer. Carrying a maximum of just 224 passengers, this is no floating city with spas and steakhouses, kids’ clubs and Broadway-style shows. There is one dining option, dishing up local and international cuisine that’s a little more hearty than refined, and there’s a small theatre used almost exclusively for port talks and lectures, plus a couple of comfortable lounges with tea and coffee stations and a room or two set aside for massages and facial treatments. Cabins on the lower decks have a no-nonsense, functional feel, but they’re spacious – and there are plans to refurbish a number of them to a more elegant standard before the next Iceland season. Although this ship is a rough Diamond in some ways, in others it genuinely excels. The service is faultless, the bridge always open, and, most importantly, the destination is placed squarely at the heart of the cruise experience. As a smaller ship, Ocean Diamond can visit the more characterful ports denied to those great gleaming ocean-going behemoths, and the expedition team is blessed with rare enthusiasm and expertise. As well as delivering bilingual lectures (my fellow cruisers were evenly divided between English and German), these local specialists accompany the majority of excursions, bringing to life the culture and the sagas, the wildlife and the geology. If you visit Iceland only once, these are the people you want to show you round. Golf in a volcano is just one of the unique experiences they offer. Want some more? How about a taste of kæstur hákarl, Iceland’s notoriously disgusting national dish of fermented shark? Days Three to Five featured more adventures that proved memorably unusual, if not unique. Isafjördur is the gateway to the dramatic Westfjords region and the seven-tiered waterfall, Dynjandi, whose uppermost cascade, an icon of the region, richly rewards a scramble up the rocks. Siglufjördur (“Siglo” to the locals), centre of the lucrative herring industry for more than half a century until overfishing depleted the catch in the 1960s, is now home to the surprisingly engaging Herring Era Museum. But the town will be more familiar to BBC4 viewers as the claustrophobic location for Trapped, Iceland’s accomplished contribution to Nordic Noir. A stop in Akureyri, capital of the North, invites appreciation of the horseshoe Godafoss falls, picturesque Lake Myvatn, and the “dark castles” of Dimmuborgir – bizarre lava formations which, inevitably in this nation of storytellers, give rise to countless legends and folktales. But for many visitors, the highlight of their whole trip must be Húsavík. Set on a bay frequented by some 15 species of ocean giant, this is the whale-spotting capital of Europe, with RIB boat excursions enjoying a success rate close to 100 per cent. But there’s a difficult decision to be made here, because the full-day Diamond Circle excursion, also from Húsavík, includes a visit to Dettifoss, Europe’s most powerful waterfall. I chose to go along, and I stood in awe as more than 40,000 gallons of water per second crashed down a drop of 44 metres, throwing up spray-clouds that formed dazzling rainbows in the sun. That same night, as if one natural wonder weren’t enough, the Northern Lights performed their celestial dance. We got the (optional) call at 1.30am to head out on deck, and a port-side walk revealed one great painterly stroke of green. But the main show was best enjoyed from the unlit foredeck – a sight breathtaking in its scope if not quite in its colour (the palest sodium yellow). A relatively quiet Day Seven prevented the onset of “wonder fatigue” – and that proved just as well, because Day Eight’s excursion was snowmobiling on Europe’s largest glacier. Vatnajökull is the ice field that dominates Iceland’s southeast. Here you can don somewhat inadequately waterproof overalls and skid across the glacier surface. We timed it rather badly, heading into the very first snowfall of the season, but the almost total whiteout did lend an extra frisson of excitement. Next came our golf day, and then Reykjavik. But this needn’t be the end of your journey, because you can book a two-night extension in the vibrant capital, and you’ll find that Iceland has a ready-made encore for you. The Golden Circle may be the island’s most beaten path, but it’s no less impressive for that – a final trio of magnificent natural phenomena. Gulfoss is another of Iceland’s mightiest waterfalls, where the Hvítá river plummets 32m over two steps into the heart of a rugged canyon. Thingvellir is the only place on earth where you can actually see the boundary between tectonic plates – the North American and the Eurasian, which are drifting apart some 2cm every year. In this auspicious place was built the 10th century Althing meeting hall of Viking chieftains, an institution that lives on today as the Icelandic Parliament. And at Geysir, the geothermal field whose name has come to define all of the world’s spouting springs, the visitor can explore an infernal landscape of bubbling pools, steaming vents and towering ejections of scalding water. While you’d be extraordinarily lucky to witness one of great Geysir’s infrequent 50m jets, the smaller Strokkur geyser gaily spouts 10 to 20m every few minutes, enrapturing its ever-present circle of spectators. If you’ve never visited Iceland before, you need to do it – it’s as simple as that. And go in high summer if you can. We enjoyed some gloriously fine days in late August, but the signs of seasonal change were already there: the aurora, that snowfall on Vatnajökull and the loss of some 10 minutes of daylight every 24 hours. Whenever you make the trip, a cruise is surely the way to do it, with so much of interest close to the coast. And there may be slightly cheaper options than a circumnavigation aboard MS Ocean Diamond, but surely none as rich in uniquely Icelandic adventures. 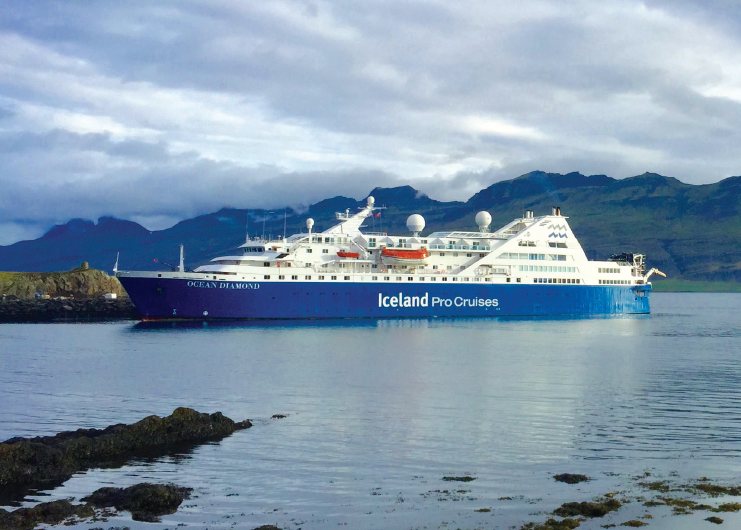 Richard Tarrant travelled as a guest of Iceland Pro Cruises and Titan Travel. Titan’s 10-day “Iceland’s Stunning Coastline” itinerary, operating May to September 2017, is priced from £2,599 per person, including door-to-door transfers, scheduled flights, a full- board 9-night cruise aboard MS Ocean Diamond, wine with dinner and a Dynjandi waterfall excursion. Approximate prices for further pre-bookable excursions range from £25 (Herring Era Museum) to £300 per person (snowmobiling). Expect to pay around £115 per person for “Golf in the Volcano”, including transfers, clubs, buggy and green fee. Two-night Reykjavik extensions are also available on request. For more details and to book, call 0800 988 5873 or visit titantravel.co.uk.